Books, books, books! Who doesn't love books? No one around here, that's for sure. 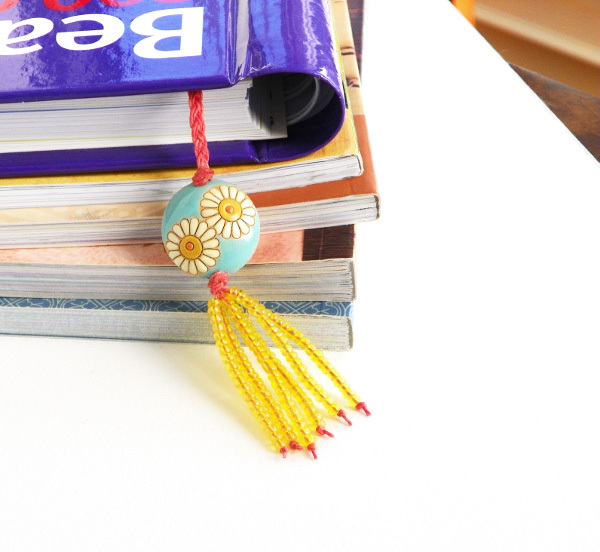 This beaded and braided bookmark is my holiday gift for family and friends this year. What a perfect time to share my project with you! Handmade bookmarks make quick and easy gifts for just about any reason or season. I made this one in less than 30 minutes. They look great holding your place in your favorite novel OR even better, your favorite beading book! Tip: Pin your work to a Macramé board to keep even tension on the cords as you braid. 1: Cut the linen cord into six 22” pieces. 2: Form an overhand knot at the end of 1 cord. String 20 seed beads. Repeat step for the remaining 5 cords. 3: Bring all six cords together and form an overhand knot after the seed beads. Use all six cords to string the daisy lentil bead; form an overhand knot after the bead. 4: Pin the last knot to the top of the macramé board with the T-pin. Separate the cords on the board so that you have 2 cords on the left, 2 cords in the middle and 2 cords on the right. Braid the cords for about 11" and remove from the board. 5: Use all six cords to form an overhand knot. 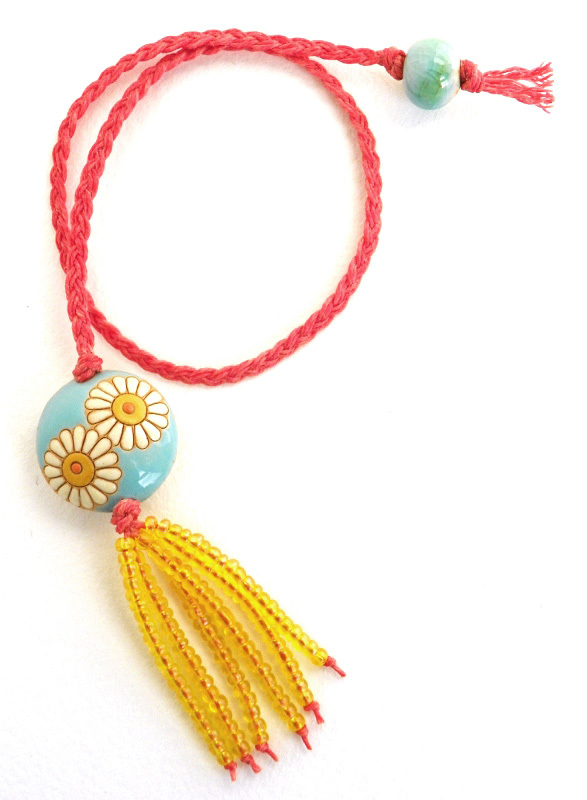 Use all six cords to string the mermaid ceramic bead and form an overhand knot. Trim ends to ½” and fray. Daisy lentil: Golem Studio. Mermaid bead: Gaea. Linen cord: Ornamentea. Seed beads: LBS. Sweet and simple, love this design. It really lets the art beads sing. Books marks are perfect gifts. Great idea beautifully done! I was seriously at a loss for a gift for someone who has almost everything! This will be great fun to give to a special book worm in my life!